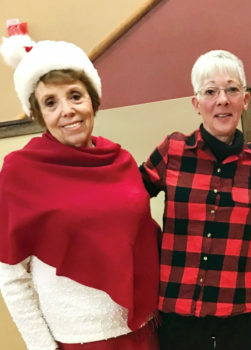 Our gratitude to Jackie Baker and Sherry Fann for devoting their time, creativity and organizational skills to the monumental success of our Christmas luncheon. A big thank you to Juanita Harbut for collecting all of the lunch ticket money and for her creative artwork in the clever and colorful place cards. 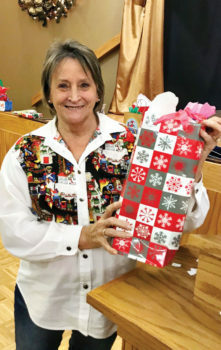 Carol Weatherbee organized the white elephant keep or steal game. We received gag, white elephants and slightly-used gifts. Everyone enjoyed the stealing and switching. Our lunch was served, for the first time, by the Horizon Room staff. The Christmas season is so busy, and preparing for our annual potluck is a time-consuming activity. It was decided this year to sit back and merely partake in our Christmas lunch. Aggi Regan spoke on behalf of St. Vincent de Paul food pantry at St. Mary’s, expressing her appreciation to the Kare Bears for our annual beneficent donations. Lunch participants brought canned goods for the organization. Aggi and many of our Kare Bear friends commit their time and energy to serve the poor at the St. Mary’s facility. The next Kare Bear meeting will be Wednesday, February 21, 1:00 p.m. in the SunBird Ballroom. Our speaker will be Lynn Lanza, a registered dietician at Paper Cranes who specializes in the field of diabetes. She will share how adopting a healthy lifestyle can promote energy and vibrancy in our golden years. 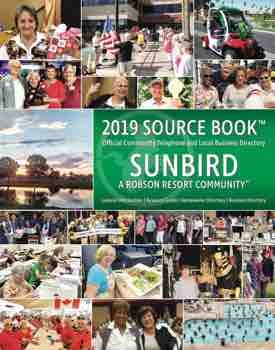 Their office is close in proximity to SunBird with a staff including one doctor and two nurse practitioners. Clients are able to schedule convenient appointments. Lynn works one-on-one with clients about lifestyle changes that can prevent stroke, dementia and osteoporosis, common maladies of which SunBird residents are acutely aware. Our daily diet should include rich sources of energy and bone builders, essential to a vigorous and robust lifestyle. A Mediterranean diet consists of fish, poultry, limiting red meat and using olive or canola oil to fry foods and consuming primarily plant-based foods, such as fruits and vegetables, whole grains, legumes and nuts and, of course, getting plenty of exercise. Don’t forget the Kare Bear Fair on Saturday, February 3. Vendors with shoes, t-shirts, jewelry, hats, health and beauty products and watch battery replacement will be in attendance. Many other products, as well as the popular white elephant table, will be offered. In addition, the Girl Scouts will offer those delicious girl scout cookies for sale. Do you have usable and/or special items that you would like to donate? Usable items for our white elephant and boutique table are always appreciated. Donations and pick-ups can be arranged by contacting Sherry Fann at 480-883-1167. The Kare Bears organization is now in its 24th year! Would you like to be a member of this great group of women? Come join us on Wednesday, February 21, at 1:00 p.m. in the ballroom. If you have any questions regarding our group, please contact Deanna Calvert, Margaret Spear, Julia Roberts, Linda Bengston or Barb Dunbar.